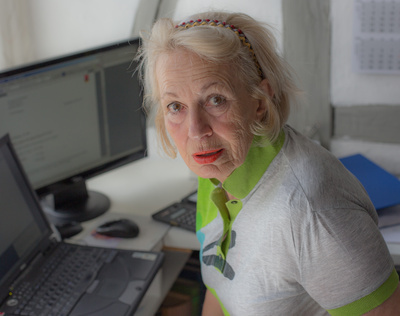 Klara is a retired maths teacher and she is only 2 years short of her 80th birthday. She is used to thinking logically and she has mastered the technological changes with flying colours. She learned how to use the internet, opened a Facebook account and observed what was happening in the web. When she had to have a knee operation, she learned how to shop online and ordered her purchases to be sent to her home. That opened up for her great freedom and enabled her to take things easier when she was recovering. I visited her to have a coffee with her. She complained that next week she had too much to do, because she had to go to the bank to make payments, then she had to deliver a form to the city and then she wanted to hand in an announcement. My ears were wide open. Why didn’t she do all this electronically, I asked her. She was not even aware that this was possible. So together we set up the electronic banking and installed an App, so that she can also do this from her telephone. Then we practised with the payments that were just due, until she could do it without making a mistake. I taught her to photograph the various completed forms and then via e-mail send them to the competent officials. After 2 hours including practice we had everything finished. What would have cost her almost 2 days’ work, was done. Klara was extremely grateful and very pleased with what she had learned. For her it was not difficult to understand and realise quickly. She had only to be shown how. Then I had to go but the whole time I kept thinking that, after retiring, it should be compulsory to go to school for a few days each year. Otherwise how could one be informed about the innovations, about the conveniences they could bring and how to use them. Categories: My Blog | Tags: improvement, life skills, Old age, Retirement, technology | Permalink.